HomeSSIs – time to de-invest in laminar flow? SSIs – time to de-invest in laminar flow? Laminar flow is a very embedded technology for the prevention of SSI in some types of surgery (especially hip and knee arthroplasty). However, it seems from a recent Lancet ID review that this widely adopted practice is way ahead of the evidence supporting it: the bottom line finding of the review is we should stop wasting time and money on laminar flow theatres for some procedures, and focus on basic prevention initiatives (especially getting antibiotic prophylaxis right) in all surgical categories. It is a stark fact that SSIs are the first or second most common HCAI, and yet in many places they are both under-rated, and under-prevented! Reading this excellent Lancet ID review on laminar flow really brought this home to me. The question of the systematic review and meta-analysis was: ‘Is the use of laminar airflow in the operating room associated with the reduction of overall or deep SSI?’ Their searches identified 1900 reports, but these were whittled down to a meagre 12 for the review and meta-analysis – and none of these were randomised. The evidence is difficult to interpret: some studies report lower rates of infection / revision, some report no difference, and some report an increase in SSI / revision associated with laminar flow! The meta-analyses for deep hip and knee SSIs both showed no significant difference in SSI rate. A few studies looked at SSI outcomes in other surgical procedures. Whilst the evidence is limited, the meta-analysis showed no significant reduction in SSI associated with laminar flow in these categories too. Overall, the evidence supporting laminar flow for surgical procedures is shaky to say the least (older, non-randomised studies, which are often poorly controlled for key variables such as antibiotic prophylaxis – or in some cases were done before antibiotic prophylaxis was used routinely – were excluded, and I agree with this approach). There’s even some evidence that laminar flow may make things worse – the meta-analysis for deep hip SSIs was teetering on the point of statistical significance for laminar flow being associated with worse SSI outcomes. Perhaps unsurprisingly, current SSI prevention guidelines do not make a ringing endorsement of laminar flow (e.g. SHEA 2014). In fact, the latest WHO guidelines recommend against the use of laminar flow for total hip or knee arthroplasty. 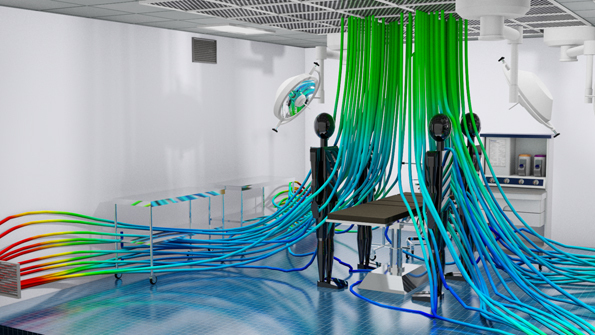 I find it very difficult to make an argument for implementing laminar flow in new theatres based on this evidence. Further still, I would find it easier to make an argument for stripping out laminar flow from existing theatres and replacing it with conventional ventilation! Not everybody will agree with this position, as illustrated by a letter published in response to this review. However, the arguments for laminar flow seem to be based on the poor quality of evidence against laminar flow. If we were starting from scratch, and considering a high-cost technology-based intervention to prevent SSI, we would be demanding high-quality evidence of effectiveness and cost-effectiveness before implementing it – and this simply isn’t there for laminar flow. In fact, cost-effectiveness modelling suggests that tip-top basic prevention strategies in conventionally ventilated theatres are the most cost-effective way to prevent SSIs. So, I think the days of laminar airflow in theatres are most definitely numbered. ← More coffee = less AMR?